If you are starting to organise your Christmas and New Year celebrations, you may well be looking into organising your crew along with travel plans for the evening, but you may still be looking into the best places to party the night away. Most venues will offer attractive festive deals to help you celebrate in style, so if you are looking to party the New Year away in Manchester, what can you expect? You can get into the Christmas and New Years spirit with Revolution bars and Revolución de Cuba. Featuring festive canapés, group packages and Yuletide cocktails, you’ll be spoilt for choice at both of these party spots in Manchester this December. New Year’s Eve celebrations will also not go amiss with stunning Cuban-themed dining, drinks a plenty, live music and latin dancing at Revolución de Cuba, or for a proper party feel you can opt for DJs spinning the decks, exploding confetti cannons and forever-flowing fizz at Revolution bars where you can continue partying into a New Year’s Day blow-out with 40% off food and drink. 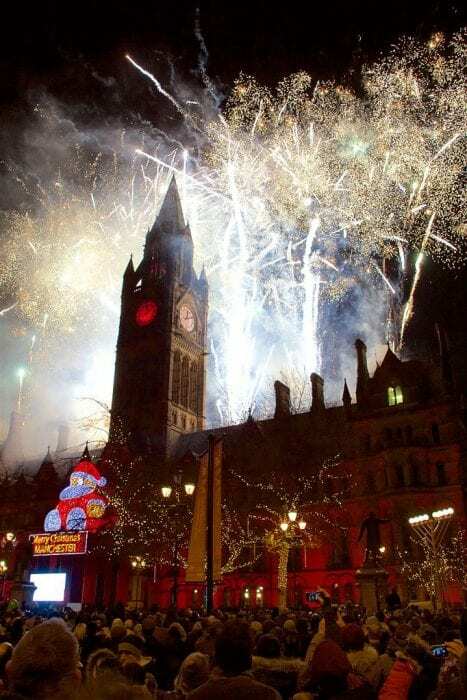 Manchester’s firework display tends to cause an awful lot of confusion as Manchester City Council delay making a decision on whether the display will go ahead until the absolute last minute. My suggestion would be to keep checking on the Internet for details of the event and where it will be held. The display may not be as flamboyant as the London New Year firework display but is still a fantastic way to ring in the New Year… if it happens. With taxi firms charging a premium for New Year travel, you may find it more cost effective to book into a city centre hotel for the evening. The InterContinental Hotels group which includes Holiday Inn and Crowne Plaza hotels are very prominent in the Manchester area, so with plenty of hotels to choose from there will certainly be some fantastic offers for the New Year, so book early! NYE in Manchester looks like a blast! I’ve never been, but would love to visit!